Most people who are new to designing surveys start out by using only a few question-types: drop-down lists; radio buttons; open-ended text boxes; and perhaps a rating or ranking scale. In many cases, those really are all you need for a simple survey. However, other question types have a lot of advantages, too. Among the most powerful is the matrix grid. New survey designers sometimes aren’t sure how to use these, or why they should bother. This question type is worth learning about if you need to ask several related questions with the same response sets. With a matrix grid, you present the participant with a series of items (usually in rows), sharing a common set of response options (usually in columns), asking one or more questions about each item. Because matrix grids group questions logically, they can clue-in respondents that you’re asking them to share opinions from a similar mindset. They also have advantages for you, as survey designer and data analyst. In this case, the respondent has to pay attention to both the topic of the question (“oh, right, that breakout session!”) and what you’re asking her to rate (its value). And she has to pay close attention to every question, since you might ask for different feedback on each session (e.g. “was the session too long, too short…?”). Even in its simplest form, a matrix grid is easier to understand, since it’s obvious to the respondent that the same scale applies to all the items listed. The matrix grid shrinks the survey visually, particularly once you get past three or four items. Anything that prevents a respondent from saying, “Enough, already! I’m tired of answering so many questions!” is helpful. Note: Don’t use that power as an excuse to list 30 items. When you do so, otherwise-thoughtful respondents stop paying attention to each item, and they choose one answer for the whole long list. (“Satisfied, satisfied, satisfied…”) Try to limit the number of items in a feedback survey to five to ten items. A matrix grid also saves you time in question construction, which is a nice extra. You supply the list-of-items and the list-of-answers just once, rather than investing time in copy-and-paste. 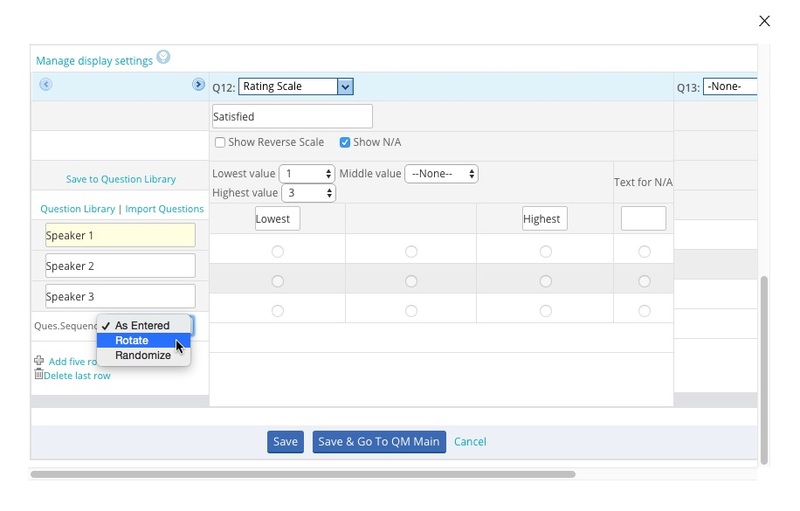 In addition, a matrix grid gives you additional control over survey flow. For instance, you can instruct SoGoSurvey to rotate or randomize the order in which the items are presented. This way, people don’t “vote” for the first three candidates they see on a list – or if they do do so, at least you know everyone is seeing a different set of people presented at the top of the list. And, of course, these question types can be used like any others in SoGoSurvey, such as with Rules and Alerts or data pre-population. Matrix grids become even more powerful when you add more questions to a matrix grid. SoGoSurvey permits seven different questions for each row. So, for example, you can use a matrix grid to create a team travel schedule, an expense report, or an element in a job application form. One SoGoSurvey matrix grid feature we’re very proud of is the Intellimatrix; it’s something we feel sets us apart. 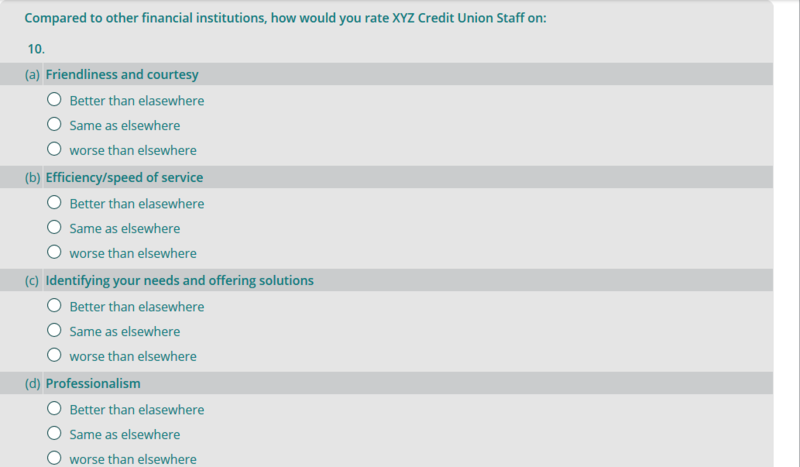 In short, the Intellimatrix lets you enable or disable matrix questions based on respondents’ answers. To continue the earlier ice cream example, imagine that we don’t want to permit someone who ranked a flavor “no way” to choose one of those flavors as her top choice. (Not a very realistic example, I admit, but let’s pretend it matters.) The SoGoSurvey branching lets you create conditions and, if they’re met, activate options in the rest of the matrix grid. So, as this survey preview shows, a respondent who dislikes the idea of a cardamom-ginger ice cream isn’t even given the option to choose that flavor. This is just a sample of the power of survey matrix grids. You can accomplish much more!